Over the past year, two NASA satellites have captured images of the oil spill in the Gulf of Mexico, which began April 20, 2010, with the explosion of the Deepwater Horizon oil rig. This short video reveals a space-based view of the burning oil rig, the spill, and the location through April 1, 2011. 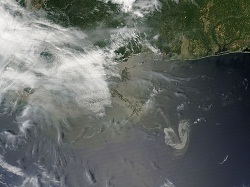 The MODIS instrument, on board NASA's Terra and Aqua satellites, captured images of the oil spill in the Gulf of Mexico. The spill began on April 20, 2010 with the explosion of the Deepwater Horizon oil rig. The oil slick appears grayish-beige in the images and changes due to changing weather, ocean currents, and the use of oil dispersing chemicals.